Riviera Nayarit Mexico Blog: Everything’s Ready For The 2nd Annual Cuisine Of The Sun! Everything’s Ready For The 2nd Annual Cuisine Of The Sun! This culinary festival takes place over four days, brigning together celebrity chefs from U.S. TV networks along with personalities from Mexico and other latitudes; it will feature cooking classes, dinners under the stars, talk shows and much more. The Villa La Estancia hotel offered an on-site press conference on Monday, March 24, where they presented details on their signature event together with the celebrity chefs that will be headlining the second annual Cuisine of the Sun. This gastronomic festival will take place April 26 – 29, 2017, under the guidance of famous Food Network chef and USFOODS culinary specialist, Penny Davidi. Ever enthusiastic, Davidi was happy to have the support of these chefs whom she calls family, as well as that of Villa La Estancia and all the sponsors that have once again made this dream a reality. 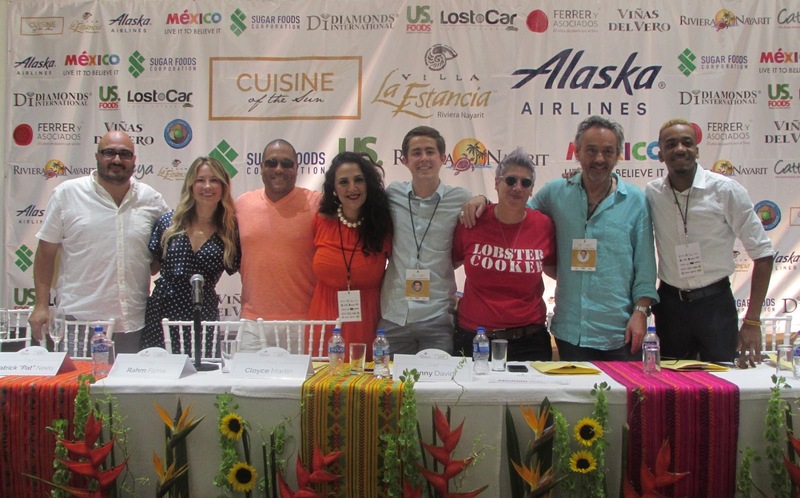 Alaska Airlines and the Riviera Nayarit Convention and Visitors Bureau top the long list of sponsors who are supporting this magnificent culinary event in Mexico’s Pacific Treasure. During the four days attendees will enjoy cocktail events with live music, tastings, fashion shows, cooking classes, dinners under the stars and the very popular talk shows among other surprises, including contests. A Twitter Party will take off on Friday April 28th from 4 p.m. through 6 p.m. with the hashtag #CuisineoftheSunFest. Penny Davidi leads the stellar lineup of celebrity chefs, accompanied by two-Michelin star recipient Gilles Epie of France, who at the age of 14 is the youngest chef to ever have received this honor; and Betty Vázquez, the Riviera Nayarit’s Culinary Ambassador. Other chefs include Patrick “Pat” Neely, also known as the King of BBQ; Chris Kyler; Rahm Fama; Michele Ragussis; Martita Jara; Dakota Weiss; and Cloyce Martin, the youngest of the group. Davina Thomasula and Israel Díaz are the mixologists on tap. For more details visit: http://cuisineofthesun.villagroupresorts.com/.